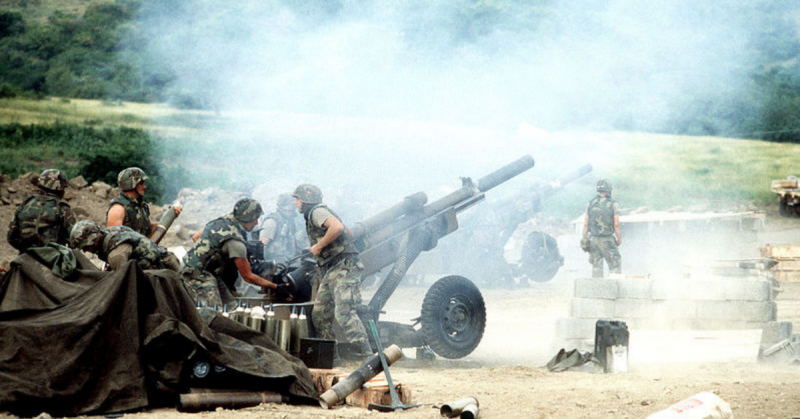 The United States’ invasion of Grenada commenced in earnest on 25 October 1983, on the orders of President Ronald Reagan. The invading force was made up of the 1st and 2nd Ranger Battalions and the 82nd Airborne Division, along with other Marines, Delta Force, and Navy SEALs, altogether numbering 7,600 troops drawn from both the U.S. and Jamaica. 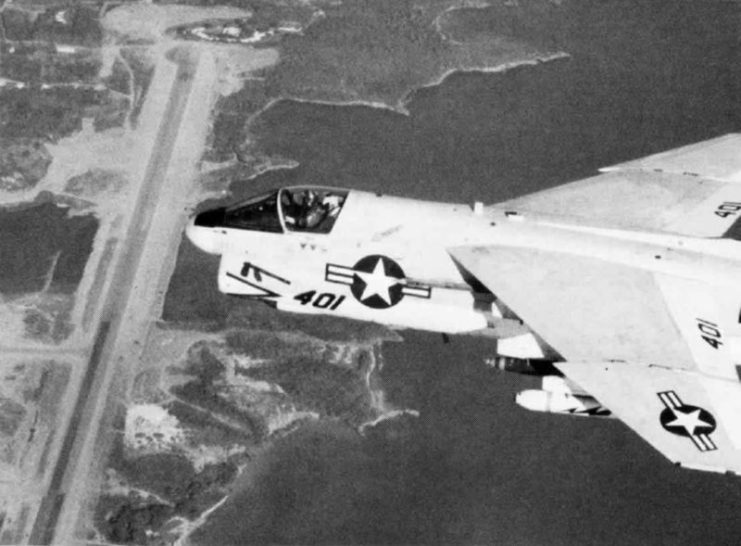 Their main objectives were to capture the Point Salines International Airport and Pearls Airport, and rescue U.S. students and Governor General Paul Scoon. The 75th Ranger Regiment was tasked with the responsibility of capturing and securing Point Salines International Airport, to allow the 82nd Airborne Division and subsequent reinforcements to land without incident. The 8th Marine regiment was assigned to the capture of Pearls Airport and rescue of the U.S. students at St. George’s University. 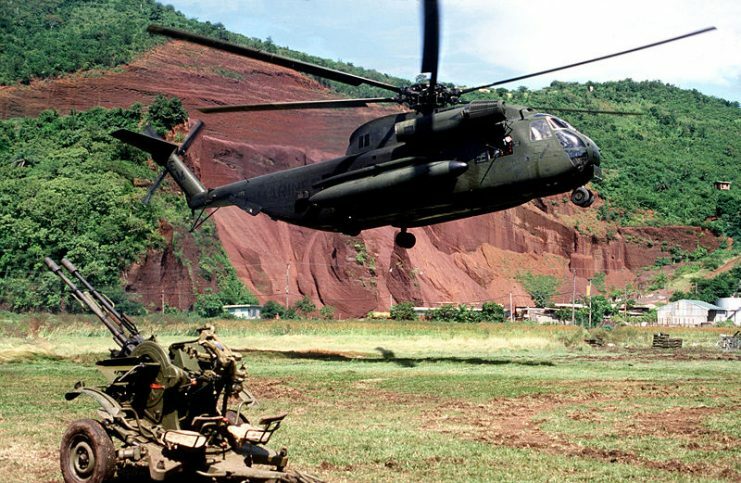 A U.S. Marine Corps Sikorsky CH-53D Sea Stallion helicopter hovers above the ground near a Soviet ZU-23 anti-aircraft weapon prior to picking it up during “Operation Urgent Fury”, the U.S. invasion of Grenada in October 1983. Two attempts had been made by U.S. Navy SEALs to do a bit of reconnaissance two days prior to the invasion, but unfortunately both attempts had failed owing to rather harsh weather conditions and poor visibility, and four navy SEALs were lost in the attempts. At midnight on 24 October, soldiers of the 75th Ranger Regiment prepared to perform an air assault landing on Point Salines International Airport, but discovered while in mid-air that the runway was blocked, so they changed tactics and performed parachute landings instead. 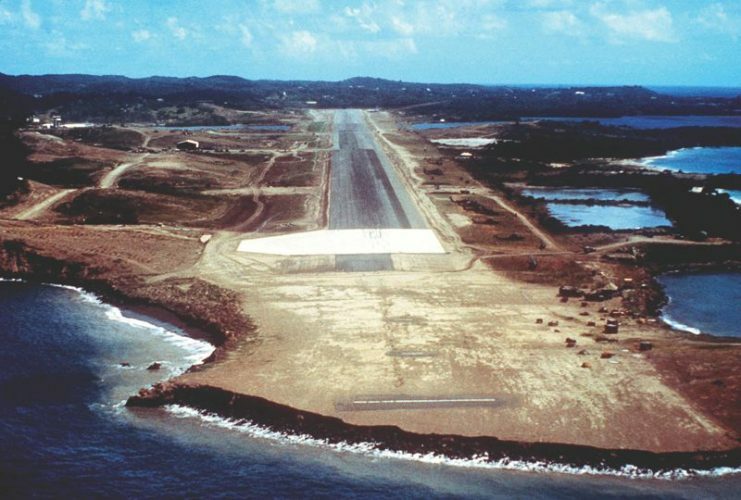 An aerial view of the approach to Point Salines Airport, taken during Operation Urgent Fury. On the ground they met some resistance from Cuban forces, but the Cubans were outmatched and the Rangers quickly moved into position, securing the airfield. The runway was cleared for airplane landings of the 82nd Airborne Division and 325th Infantry Regiment, who quickly arrived with reinforcements. Soon, over a hundred Cubans at the airport surrendered in the face of unarguable defeat. The soldiers went on to their next objective of securing the U.S. students at St. George’s University, but were surprised to learn from the 140 students they secured at True Blue Campus that not all the U.S. students resided there. The remaining students were reported to be at the other campus in Grand Anse. The Rangers lost a patrol jeep in the frenzied search for the U.S. students at True Blue campus, and it was later discovered that the jeep had been ambushed and four of its Rangers killed. In all, they lost five soldiers in the rescue but succeeded in accomplishing their objective. Meanwhile a group of Navy SEALs led by Lieutenant Mike Walsh were the first to get to Pearl Airport. Reconnaissance showed that the area was relatively unguarded but simultaneously unsuitable for amphibious landings. This they communicated to the 2nd Battalion of the 8th Marine regiment, which then landed south of Pearl Airport using helicopters. The Marines encountered only minimal resistance and succeeded in capturing the airport. On the mission to rescue Governor General Paul Scoon in his mansion at Saint George, Grenada, a SEAL team set out from Barbados but were oblivious that they were walking into an ambush. The Grenadian soldiers were already aware of the U.S. invasion by that time, so they cleared the entrance into the mansion so that after the SEALs got in to secure the governor, they would be trapped in it with him. This siege situation went on for 24 hours in a deadlock, but eventually U.S. Marines from G Company of the 22nd Marine Assault Unit landed on Grand Mal Bay and rescued the SEALs, evacuating the governor and his household on 26 October. On the same day, U.S. Rangers of the 2nd Battalion embarked on their next mission to rescue the U.S. students at Grand Anse. They launched an air assault from their helicopters and although the campus guards tried to resist, they were outnumbered and outgunned, so they eventually fled. The 233 U.S. students there were all successfully evacuated. Only one Ranger was wounded in this mission, and one chopper crashed into a palm tree and was lost. 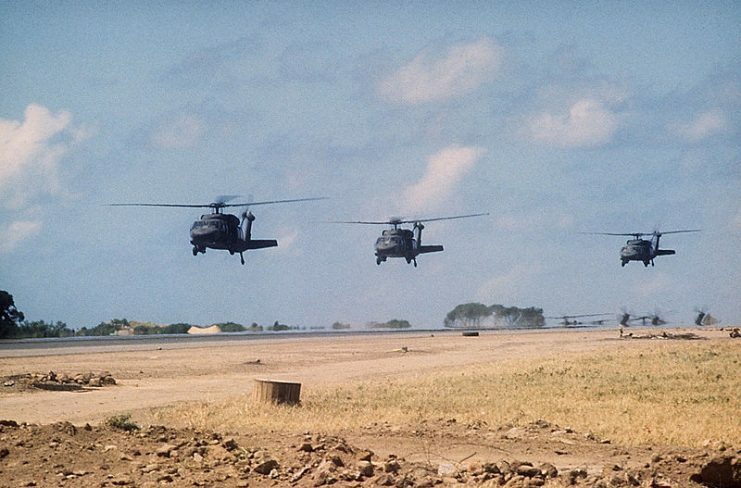 UH-60A Black Hawk helicopters over Point Salines. The conflict saw the first use of the UH-60 Blackhawk. The invasion continued on multiple fronts and on 27 October there was very little resistance left to overcome. The 325th Infantry Regiment did another sweep of Grand Anse and discovered another group of twenty U.S. students they had missed the previous day. 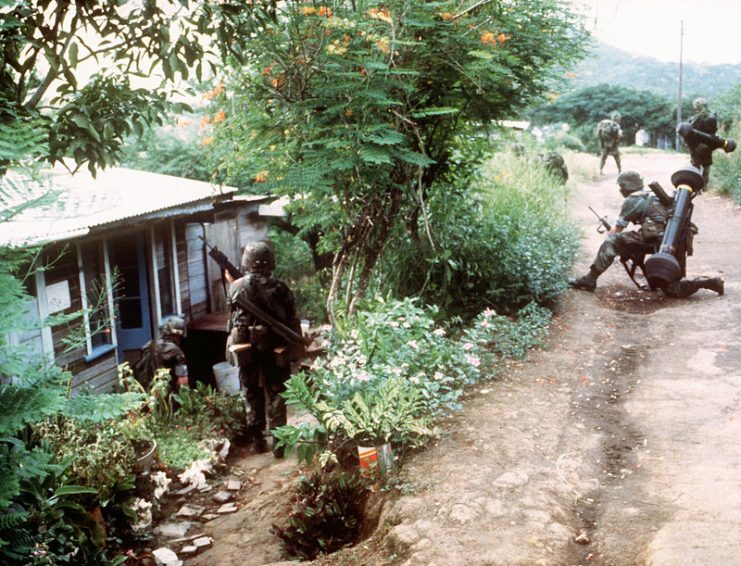 In the town of Ruth Howard, U.S. troops encountered Grenadian resistance and called in an airstrike, but the shots accidentally hit the command post of the 2nd Brigade, wounding 17 soldiers and killing one. 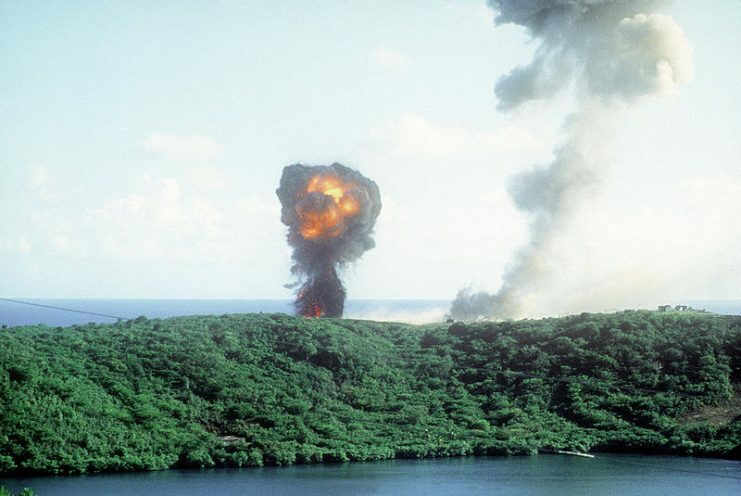 Meanwhile, as the 2nd Battalion of the 75th Ranger Regiment prepared to make an air assault to crush the final wave of Grenadian soldiers at the Calivigny Barracks, which was just over 3 miles from the Point Salines airfield, one of the helicopters approached too fast and crashed into two other choppers, wounding four soldiers and killing three. Finally, after combined sea and helicopter landings on Carriacou Island on 1 November, the People’s Revolutionary Army of Grenada surrendered, bringing an end to the invasion. The invasion showed flaws in the U.S. communication system. Soldiers were sent into battle with little to no information, and whatever little information they had can best be described as supposition. They did not have sufficient information about the terrain, as the invading soldiers were given old tourist maps of Grenada that had zero detail regarding topography and other important strategic information. As another example, soldiers did not know that the U.S. medical students were actually at two different campuses that were about thirty minutes apart. Also, during an operation in Ruth Howard, a U.S. support aircraft mistakenly fired upon and killed U.S. ground forces because there were discrepancies in location coordinates in their maps. There was another incident during the operation in which U.S. aircraft targeting anti-aircraft guns unintentionally bombed a mental hospital, killing 18 people and adding unnecessarily to civilian casualties. These mistakes occurred largely due to lack of verified ground intelligence. The U.S. suffered 125 total casualties, of which 19 were killed and 106 were injured. 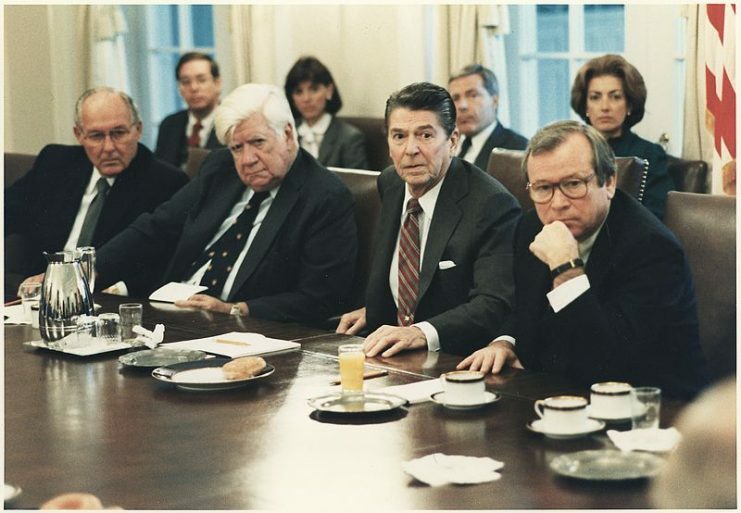 After the operation, the U.S. Department of Defense (DoD) adopted the Goldwater-Nicholas Act which reworked the command structure of the U.S. military, thereby making some of the most important changes to the DoD since its establishment in the National Security Act of 1947. Some may argue that the U.S. victory was based on its overwhelming number of soldiers relative to that of the poorly trained and unprepared Grenadian-Cuban coalition, but a fair point remains that the opposition had ample room to prepare against the invasion and they also had detailed knowledge of the terrain, both of which could have been used to their advantage. 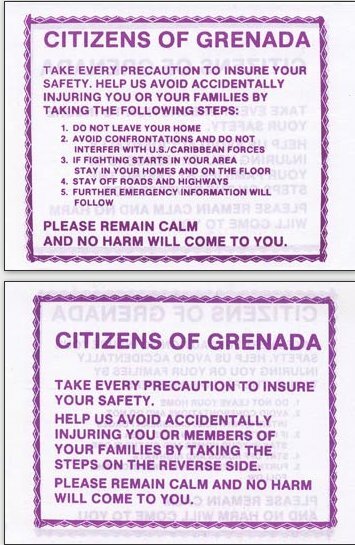 The U.S. invasion of Grenada was a success in spite of the lack of pertinent intelligence and other shortcomings that the invasion forces encountered. They were able to improvise with the tourist maps they had been given and coordinate themselves on the ground. The U.S. forces accomplished all their objectives and succeeded in rescuing their students and governor Scoon, and they did it with a relatively low casualty count.